In the high, hot summer of 1858 the House of Commons investigated a Great Stink arising from the River Thames. One hundred and fifty eight years later, in a month which has seen the hottest September day since 1911, it may be that time is running out for a more contemporary great stink emanating from London’s famous river. That arising from the increasingly desperate looking Garden Bridge project. In 1858 the MP’s in the House of Commons attempted to ward off the smell with handkerchiefs clamped over noses and curtains soaked in Chloride of Lime. In 2016 the handkerchiefs are being sniffed by the queue of individuals and organisations from the Mayor of London Sadiq Khan on down, which all seem to be waiting for each other to pull the plug on the magic cash and procurement machine which is keeping the beleaguered Garden Bridge project alive. The London Mayor’s latest move to further delay a decision, and perhaps the entire project, is an inquiry into the value for money of the Garden Bridge to be chaired by the highly respected former chair of the House of Commons, Public Accounts Committee, Margaret Hodge. The inquiry will have the effect of kicking the Garden Bridge still further into the Thames side ooze. However, if the recent report from LBC Political Editor Theo Usherwood that the Garden Bridge Trust is running out of cash, is correct, then Mrs Hodge, Mr Khan and everyone else involved, may be spared the difficulty of actually having to make a decision. Throughout the history of the Garden Bridge no-one from Historic England and Lambeth Council to Transport for London, the London Assembly and Coin Street Community Builders seems to have been able or prepared to say a final “no” to the celebrity driven project, and to its high level political backers, Boris Johnson and George Osborne. 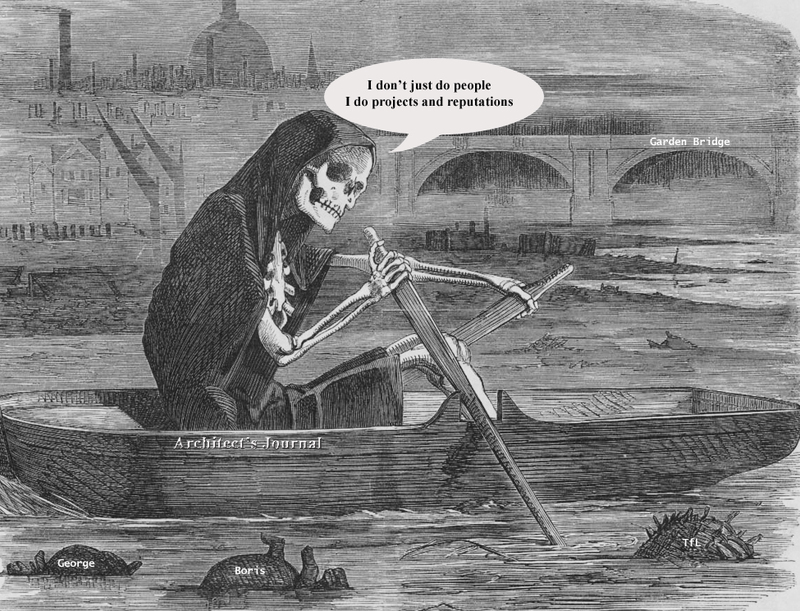 Even when the procurement process for the bridge has been shown over again to have been “unorthodox” to say the least, and the finances of the Garden Bridge Trust have been demonstrated to be utterly opaque, with more smoke, mirrors and misdirection on display than the last time magician Jasper Maskelyne tried to hide the Suez canal from the Luftwaffe, the magic tap of public money continued to pour its largesse into the, CGI fueled, alternative reality of Thomas Heatherwick’s great, copper sheathed, green washed, intercept money sewer. Now LBC reports that high level sources in Whitehall and at the Mayors Office on the South Bank, are describing the Garden Bridge project as being on “life support” and that some even expect that a cash crisis may mean the horticultural dream of actress Joanna Lumley may never be built, thus saving the historic view of St Pauls Cathedral from the South Bank when Historic England would not. Fueling such speculation, Mr Usherwood also alleges that just one of the declared donors to the Garden Bridge project which he was able to contact, Citigroup, would commit its money before construction work starts. At least a further £23 million of the resources pledged to the Garden BridgeTrust, including £20 million from the Monument trust, remains purely theoretical, until the chain saws and backhoes actually move in on the South Bank, and at Temple. While in any case the Garden Bridge is now a year behind schedule and more than £120 million over the budget of £60 million of privately raised cash originally proposed. Indeed, the Trust is evidently struggling to fill a shortfall of at least £50 million in the required funding, and that is just on the current budget of £185 million and counting. Adding to the woes of the Garden Bridge Trust, and the list of potential inquiries, the MP for Vauxhall Kate Hoey, who led an adjournment debate about the Garden Bridge in the House of Commons on 7 September, has written to the Charities Commission asking the regulator to investigate the financial management of the Garden Bridge Trust. The move comes amid allegations that such is the lack of transparency in its financial dealings, the Trust might even be able to award contracts to a number of anonymous donors to the project. In turn the Charities Commission has confirmed to LBC that it is in the preliminary stages of starting an investigation. LBC also confirmed that the lack of actual hard cash donated by the “tremendously kind and rich people” , who Joanna Lumley claimed were offering a gift to people without a garden, means that the project has only been able to keep going because of the public money committed by former Chancellor George Osborne and former London Mayor Boris Johnson. That unmandated gift from tremendously kind, but, all to often, not very rich, London Council Tax payers included a transfusion of £7 million committed by the then outgoing Mayor Johnson as recently as February this year, supposedly on the understanding that construction was about to commence. Which of course it was not. Satire died the day the Garden Bridge Trust criticised anyone for wasting public money. Meanwhile the current cash burn is believed to be as much as £500,000 per month with nothing to show for it except the efforts of those PRO’s, a web site, a series of press releases and media performances by Garden Bridge Trust chair, Lord Mervyn Davies, and project instigator Joanna Lumley, which seem increasingly to be grounded in a world view which is so in denial of the reality of the project’s commercial clothes and apparent financial predicament, that they would have been blue pencilled as unrealistic by Joseph Goebbels in May 1945. Further complicating the issue are what are believed to be punitive cancellation clauses in the construction contracts which the Garden Bridge Trust has signed, and the clauses in charity law making trustees responsible personally for clean up if the bridge is started before it is fully funded and not completed. As the alleged profligacy of the Garden Bridge Trust with taxpayers money becomes ever more apparent, Londoners may also want to ask why, when Will Hurst of the specialist Architect’s Journal and their local commercial talk radio station, LBC, can publish a level of investigative analysis which has brought the project to its knees, their only evening newspaper, the London Evening Standard, seems to lack any curiosity regarding the Garden Bridge at all? She might have added that the editor of the Evening Standard, Sarah Sands, is understood to be a long standing friend of former London Mayor now Foreign Secretary, and Garden Bridge money bags Alexander Boris de Pfeffel Johnson. Friendships may have proven very useful in the Garden Bridge saga, as another long standing Johnson family friend, and Mr Johnson’s former baby sitter, Joanna Lumley, can probably attest. As in 1858 the stink from the direction of the river is rising to a point where for London and Westminster’s politicians, taking action to stop it may become unavoidable, and the stink rising from the Garden Bridge is not that of fertiliser for Ms Lumley and Mr Haetherwick’s pot plants.